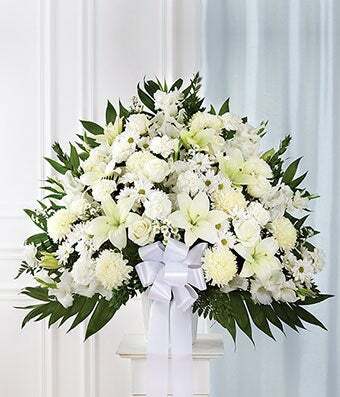 White sympathy flower standing basket to convey your deepest condolences. A beautiful way to let them know you are thinking of them during this difficult time. Created with white flowers including white roses, white lilies and white snapdragons. Medium measures approximately 32"H x 36"L without stand.